Making your car go faster has several basic components. One is to have more power. Another factor is to make your car lighter, and one part of that is making the driver weigh less. Brian and I have been working out a bit in an effort to reduce driver weight, but this weekend we took on a unique way to do that when we entered the Krispy Kreme Challenge. For the past ten years, the Krispy Kreme Challenge in Raleigh NC has tried to answer this question, "Can I run 5 miles and eat 12 donuts in less than an hour?" My thinking is that the first caveman came up with this when he tried to eat as much meat as possible, and then try to outrun whatever wild animal was trying to eat him! 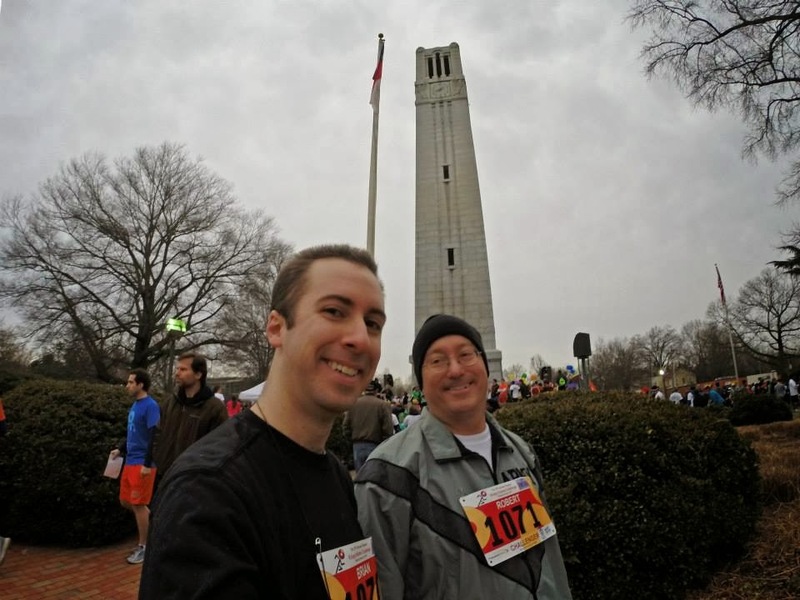 In Raleigh though, the question apparenlty started with some North Carolina State University students, and after one thing led to another, we now have an annual tradition that this year found about 4,700 runners going for the challenge. I figured I could run 5 miles in an hour, but didn't know about the 12 donuts. The way the run is organized, you have to eat them all at the halfway point, then get an official to confirm you ate them, and then they let you run the last half. I've done my share of training to eat all my life, so didn't really practice eating donuts quickly, and figured that on race day my pulse rate and stomach would tell me if my body could go for eating all 12. Race day was chilly, with just a chance of rain, so we headed out and lined up for the run. One thing about running with thousands of people is that for the first mile or two you just can't run at a normal pace, since there are slower and faster paced runners all mixed together. Even so, Brian went ahead of me in the first mile and I decided to just keep a steady pace. This is a great excuse for any slow runner like me, and works well when combined with being twice as old. I hit the donut station at about 22 minutes, so some quick math told me that I'd have 16 minutes to eat those donuts. Walking with my box of 12 sugar bombs, I started eating the first one by itself. As you might imagine, when you have to cook and lay out 36,000 donuts, they aren't going to be HOT NOW, so that takes away a bit of the magic of eating hot donuts. After the first donut, I continued walking through a mass of people who were all doing the same thing, or sitting on the street, or crowding around the water station. Funny how running a few miles and eating that sugary goodness makes you thirsty. On my second donut I had to get more serious, so I smashed two together and took care of donuts 2-5. About this time I found Brian, and we both agreed that this was going to be tough, both in eating them all and with not really having more water. Or a cup of coffee. Or a way to wash the sugar off our hands. No matter, we were there to do our best, and continued eating, while at the same time calculating the running clock, the 2.5 miles to go, and that growing feeling of, well, something in the stomach. I ate one more single, which got me up to 6, and decided that this was not going to be the day I ate 12 donuts. Brian kept going and finished 7 or 7 and a half, and then we agreed it was time to finish the run, and not worry so much about the dozen donuts. The route back to the start was a bit hilly up and down, and I enjoyed the down hill sections a lot more. But somewhere on the way back, with 6 donuts added to my weight, well, I guess the physics just didn't work, and I finished in 1 hour, 2 minutes, and about 38 seconds. Without standing around eating the 5 miles would have been way under an hour, and without the running, well, I still couldn't eat 12 donuts. Brian finished just a few seconds over the one hour, so he takes first place for Nixon Motor Sports in the running and donut eating contest. The Krispy Kreme Challenge folks donated a check for $200,000 to Children's Hospital, so in the long run, it was good to know that the hospital was the winner.